'Time Banks' Help Spaniards Weather Financial Crisis In Spain, a parallel economy has sprung up amid high unemployment and insecurity over the euro's future. Some Spaniards have created time banks, with workers earning hours, rather than money, and then bartering those hours for other services. Unemployment is rampant in Spain and full-time jobs are scarce. Here a woman works at a street stall in Madrid. Some Spaniards are signing up for "time banks," where individuals perform services based on their skills, and receive another service in return. No money changes hands. 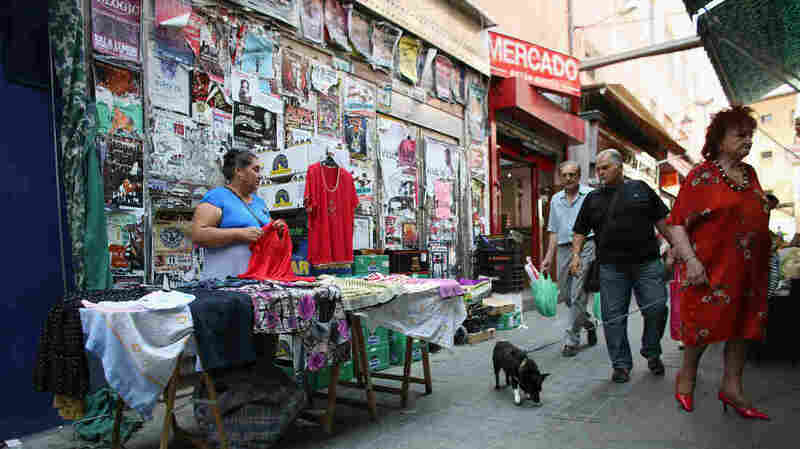 A woman is shown here working at a street stall in Madrid. After saving money for years, Lola Sanchez was finally able to buy a car refitted with a ramp and space for a wheelchair in the back for her teenage son, who has cerebral palsy. A nurse used to come each day to help with her son's care. That service was cut amid government austerity measures, though Sanchez still gets a small check every month. "What I need is physical help, even more than financial assistance," Sanchez says, "because I can't physically lift him on my own." So earlier this year, Sanchez joined a local "time bank" that sends members to help with her son's care. She doesn't pay them. Instead, she reciprocates by using her handicap-friendly car to transport other disabled people in her community. With Spanish unemployment near 25 percent, many people have more time than money to spend. So in the past two years, the number of time banks in Spain has doubled, to nearly 300. Most have anywhere from 50 to 400 members, and some even print their own currency. Most of all, they stress equality, Sanchez says. "For me, it's good to know that my time has the same value as anyone else's," she says. "There's no difference between one hour of work for a computer specialist or for a cleaning woman." Time banks originated in the 19th century in America and Europe among socialists who emphasized the direct link between their labor and what they could get for it. Most time banks nowadays operate online. You register for a profile — sort of like a Facebook page — that lists your work skills, and then lists the tasks you're looking for someone else to do for you. "Whatever you can imagine," says José Luis Herranz. "You can fix a car, or paint a wall, or cook some food, or even clean the windows." Herranz helped start the time bank Sanchez belongs to in Madrid, late last year. The 27-year-old monitors the barter of services among members — about a third of whom are unemployed — and logs their hours online. Amid constant government cutbacks, Herranz says the time bank gives people much-needed work, and also a sense of purpose. "We have to trust each other, to create solidarity networks," he says. "We feel we are alone, and we have to help each other." Julio Gisbert is a conventional banker, but spends his spare time as a consultant to time banks across Spain. He helps them avoid charges of tax evasion — people are working, but not for money, so they pay no income tax. "One of the rules is that the services exchanged can't be continuous and indefinite," Gisbert says. "Imagine you're a time banker who teaches English, and someone wants classes every week," he says. "In theory, the time bank can't do that because an English-language academy can come along and denounce you. They're paying tax and their professors, and you're not." So the services must be sporadic to be legal. That doesn't stop some time bankers from working 20 hours a week, in a variety of odd jobs. Gisbert says time banks are especially useful in Spain, where traditionally close family ties have been fractured by urbanization in the past generation, and now by unemployment. "It's a question of reconstructing the sense of community that used to exist in Spanish villages in the old days, which doesn't exist here in the city," he says. José Luis Herranz, the time bank organizer, is now getting his 55-year-old mother, Maribel, involved in Madrid. "I was born here in this neighborhood, and wow. How things have changed," she says. A housewife all her life, Maribel is working outside the home for the first time, side by side with younger neighbors who've been laid off from their jobs. She gives cooking lessons and does grocery shopping for the elderly. The neighborhood's jobless rate is still at an all-time high, at more than 30 percent. But through their time bank, these neighbors have found a way to be productive.